My research interests lie in understanding the principles controlling the distribution, accumulation and preservation of organic matter in organic-rich mudstones and its transformation through the cycle of burial and uplift. I apply the methods of organic petrology to provide new insights into the formation of potential Mesozoic hydrocarbon source rocks. In order to provide a comprehensive characterisation of the organic matter I incorporate the integrated results of organic geochemistry. The use of organic petrography in conjunction with organic geochemistry sheds light on the origin of the different type of amorphous organic matter, which provides the high generation properties of hydrocarbon source rocks. I received a PhD from University of Tübingen. 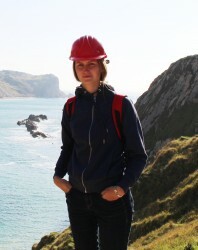 This project concerned the petrographic investigation of the Toarcian Posidonia Shale. The main objectives of this study were to identify the organic microfacies from three sedimentary basins (the West Netherlands, Lower Saxony Basin and southwestern German Basin), to assess the generation properties of the source rocks and to reconstruct the paleoenvironmental conditions, in which these organic-rich sediments were accumulated.